At least 2,000 people have fled their homes in Michoacan state, in western Mexico, amid several days of fighting between gangs. The worst of the violence is centred on the town of Buenavista. Streets are deserted in some suburbs but in central areas witnesses reported bursts of automatic weapon fire. It is believed to be factional infighting within the La Familia cartel. At least three people are confirmed dead but a local newspaper journalist told the BBC by phone the rival gangs had removed their fallen comrades from the streets. She said it was some of the worst violence to hit Michoacan state. A shelter has been set up for the displaced families from Buenavista. The army and marine units have been despatched to the area and have set up roadblocks. Meanwhile, the authorities in the Pacific coast state of Nayarit say the death toll after a gun battle between rival gangs has now risen to at least 29. 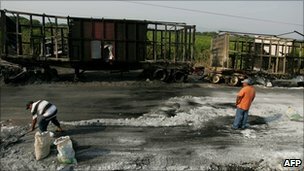 The gunfight took place on Wednesday at a crossroads near Ruiz, some 800km (500 miles) north-west of Mexico City. A film of a woman being beheaded in Mexico caused an international outcry when Facebook refused to remove the offending footage from its site. Why has no-one identified the victim? Who is behind Mexico's drug-related violence? Guzman arrest: A coup for President Pena Nieto? Many in Mexico's Apatzingan fear the town will become the main focus of fighting between vigilantes and the Knights Templar drug cartel, as Will Grant reports.